"Les femmes d’Alger, Picasso, version O" by Source (WP:NFCC#4). Licensed under Fair use via Wikipedia. 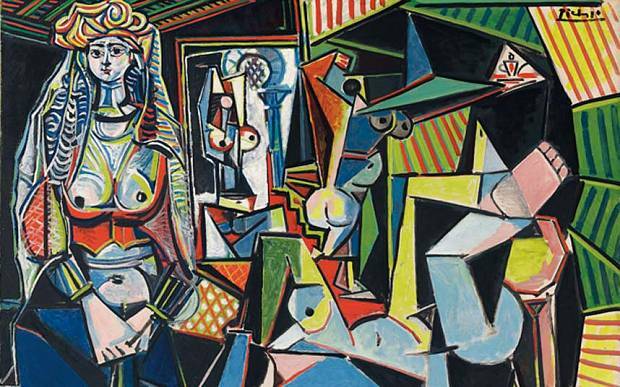 This summer, eyebrows shot up when a mid-century Picasso painting, titled Les Femmes d’Alger (Version ‘O’), brought down the hammer at 179 million dollars (with taxes) at Christie’s — the highest amount ever paid for a single work of art sold at an auction. The sighs in the Rockefeller Center auction room in New York could well have been provoked not only by the staggering amount paid by a secret buyer, but by the fact that this was a rather mediocre Picasso, vividly coloured, self-referential and quite flashy. Was this a flash in the pan or a signal that the art market, which went on a steep downturn after 2008, had bounced back to near-normal and was continuing its way north? No doubt the art market is alive, well and kicking, and shrewd art dealers are laughing all the way to the bank. But giving it the kiss of life, as I learned after a couple of days in Manhattan last month, might be a proliferating breed of super rich buyers who can sign a cheque for over a 100 million dollars without blinking, even to cater to a fleeting fancy. Records are coming down like bowling pins. Les Femmes d’Alger wasn’t the only record-breaker that evening at Christie’s; there were nine others, including Alberto Giacometti’s life size sculpture titled Pointing Man. The mystery buyer for Les Femmes is rumoured to be a Sheikh. We are now in a new era of the art market, according to a savvy gallerist friend in New York. Collectors from all parts of the world are vying for the best works of art, he tells me, adding, “The Chinese, Russian and Arab collectors are responsible for the record-breaking prices because they are mostly after the same thing.” Picasso seems to be the hot new favourite: a Chinese movie moghul, Wang Zhongjun, recently bought the painter’s Femme au Chignon Dans un Fauteuil for nearly 30 million dollars at a Sotheby’s auction. It was once owned by the late Sam Goldwyn, the Hollywood movie moghul of another era. Mr Wang, considered to be one of the richest men in China, bought a Van Gogh still life for nearly 62 million dollars last winter at Sotheby’s. It now hangs in his Hong Kong home. You see the drift: the new supernovas are increasingly to be found in the East, Russia or Qatar and its neighbourhood, overflowing with Sheikhs and ‘Sheikhas’ with bottomless pockets. Meanwhile, the European and American collectors appear to be more reticent. It seems that the emerging tribes of the uber-rich are chasing the same Picasso — or a Picasso at the very least. But the trouble is that the number of bona fide Picassos with kosher provenance is decreasing in number. The Spanish painter is currently the new hottie because he is probably the most recognisable brand; and it is getting to be more about well-established and enduring ‘brand name’ artists than the art itself, not too different from what happens in the fashion industry or with pop stars. The reopening of the Musée Picasso in Paris after a few years has been pulling in the hordes, giving the artist even more cachet. Besides, a Picasso invites instant recognition: your guests know you have arrived. If not a Picasso, then these buyers are stalking the more established art, classics, such as the Impressionists and Modernists. Conceptual art, video art, installations and trendy art may be inundating the Venice Biennale, art fairs, filling contemporary art museums and giving the ever-more-visible and audible curators more heft. But it is the quieter, more established oeuvres d’art that are drawing in the newer, recently minted billionaires. Indian tycoons are also being targeted by the major auction houses. But they have their work cut out for them. Unlike the Chinese and Arabs who are investing in international art, Indians and NRIs are usually interested in buying only Indian art. A delightful self-portrait, (a rare profile) of Amrita Sher-Gil, painted when she was 18, is up for auction at Christie’s in London. Declared a national treasure in 1972, Sher-Gil’s paintings are not allowed to leave India. And, there are very few paintings by her in the market; after all she died when she was 28. By the time this column appears, the hammer would already come down on this newly discovered painting which has been in France all this time. The pre-sale estimate is between 1.6 and 2.7 million dollars. I can’t wait to find to find out how much it went for and who bought it: an Indian collector with deepening pockets who is probably already in London for the summer, an NRI from Dubai or an international collector interested in modern Indian art. Meanwhile, the revitalised art market in New York is drawing gallerists from overseas. The Sundaram Tagore Gallery has been in Manhattan for quite a while. When the art market began to get a bit depressed, Sundaram Tagore opened another gallery in Hong Kong, where he moved. Tagore is returning to Manhattan this August and is planning to open another gallery on Madison Avenue. The growing number of Indian billionaires in Manhattan, USA, has also begun to attract Indian gallerists. Delhi Art Gallery (DAG) opened a branch in the Fuller Building, a Madison Avenue Art Deco tower in the Upper East Side earlier this year. Interestingly, just like the Chinese, the Russians and Arabs are chasing the modernists; rather than trendy art, Indian buyers are seeking the increasingly scarce Ravi Varmas (the genuine ones), the Progressives and the elusive Sher-Gils.